I was excited to come across an artefact from the Warring States period (481-221 BCE.) consisting of a silver belt and jade hook embellished with 3 jade jues and 3 warring states eyebeads. I had not previously known that Warring Sates eyebeads could be used as a decorative element on another article. I had thought that such beads were only meant to be worn. So it was indeed a revelation and it prompted me to dig out my own jade jues and Warring States eyebeads for some kind of action. Lacking a silver belt, I then made do with my jues and eyebeads to come up with the following composition "Eyes in Jade Jues" A jue is a slit ring and were used as earrings in ancient China and neighbouring Vietnam. Eyebeads are the famed Warring States beads from China. 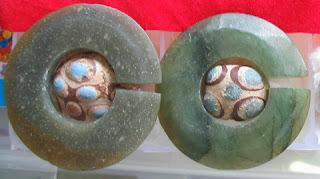 The two jade jues used in above picture are from Vietnam's Sa Hu culture ((1000BC-200AD). The eyebeads are from Warring States period (481-221BC)and were purchased in China. So this is what we would call a "rojak" combination of styles, periods and cultures. The jues are well polished nephrite with bevelled edges and even after many centuries of burial are still wonderfully tactile. The eyebeads are made of faience(ie not glass) with glaze decorations and are full of attitude. Apologies that the jues and eyebeads are not perfect fits but I had to make do as it is not easy to have a large supply of these ancient materials. Just hope this humble illustration of "Eyes in Jues" will be an eyeopener for jade and bead lovers everywhere.